Teaching is probably the greatest calling one can have. Teaching gets lots of negative airplay on the media these days. Frankly, that’s probably because people are more attracted to stories about conflict and disaster than the stories of triumph surrounding teaching. What do you think about this? Teaching was not my first calling. In my senior year of high school, I wanted to be a computer programmer making video games in my own private business venture. 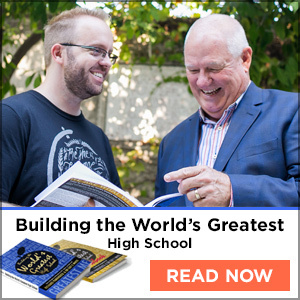 Through a number of happenings, and because of the influence of the best teachers I met during high school and college, I began to feel the calling toward (what I regard as) the greatest career calling on the planet. As I mentioned in one of my books, I believe that “no one gets anywhere without a teacher.” Think about that - can you think of anyone that got somewhere without one? Also, as I presented this article about teachers quitting their jobs and this article about teacher stresses, I reached out to some of my dear teacher friends to ask them one simple question: “Why should teachers NOT quit their jobs?” Here’s what they said. People are called to be teachers. They feel a pull toward teaching as a way by which to use their gifts well. Teaching is one of the few careers in which I can infuse my interests and enthrallment regarding creativity, writing, personal growth and literature (to name a few) into my work with other human beings. Because education changes lives (generations of lives), teaching changes lives. When I was a kid, I knew I would become a superhero of some kind. Little did I know that I would not be wearing a cape, but glasses and a sweater instead. Teaching allows me to elevate and invigorate the lives of my students beyond my school’s walls. Generations of lives will be changed. Teaching elevates the life of the teacher as well. Teaching requires that we learn more and more, and sharpen our ability to teach better and better. We are constantly being called to become the World’s Greatest Version of ourselves. Few careers offer such an aspirational quality by default; in teaching, the expectation is that we are constantly growing. If we are not growing, we cannot help our students. Teaching offers no chance of hiding. There are eyeballs looking at us constantly. There is no reprieve from the little stresses of day-to-day work. For this reason, teaching offers us the opportunity to work with these little things as the path of growth. As my favorite author Pema Chödrön states, it’s through working with these small concerns that we can ultimately grow as a human being. I am exceedingly grateful to my students that I can work with them by being (almost) constantly forced to deal with the unexpected.